Persistence Market Research offers an eight year forecast on the global Cushing’s syndrome and Acromegaly Treatment market. The primary objective of the report is to offer updates and information related to the opportunities in the Cushing’s syndrome and Acromegaly Treatment market. In terms of revenue, the global Cushing’s syndrome and Acromegaly treatment market is expected to register a CAGR of 9.3% during the forecast period, 2018–2026. The primary objective of the report is to offer insights on the market dynamics that can influence the growth of the global Cushing’s syndrome and Acromegaly treatment market over the forecast period. Insights on the key trends, drivers, restraints, value forecasts and opportunities for companies operating in the global Cushing’s syndrome and Acromegaly treatment market are presented in the report. The global market for Cushing’s syndrome and Acromegaly treatment is expected to witness higher single digit growth value owing to the growing prevalence and rates of screening of Cushing’s syndrome and acromegaly, growth in awareness and development of healthcare infrastructure. The increase in incidence of Cushing’s syndrome and Acromegaly is the major factor driving the growth of the global Cushing’s syndrome and Acromegaly treatment market. The advances in imaging such as advent of magnetic resonance imaging, computed tomography and among others are increasing the adoption of Cushing’s syndrome and Acromegaly treatment. 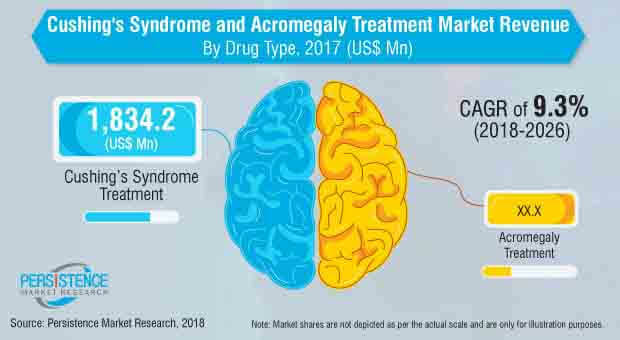 The demand for non-invasive treatment coupled with the relapse rates of Cushing’s syndrome and Acromegaly after surgery is driving a large adoption of drug treatment for Cushing’s syndrome and Acromegaly Treatment market. Increasing investments in the research and development coupled with the entry of deep pocketed companies in the Cushing’s syndrome and Acromegaly treatment market is expected to generate momentum and growth opportunities for the Cushing’s syndrome and Acromegaly Treatment market. The manufacturers are focusing on the production of targeted therapies and technologically advanced products. Technological advancements is resulting in faster product development and shorter lifecycles of the products. The report does not includes the revenue generated by the sale of Cushing’s syndrome and Acromegaly products used in fields other than treatment. Currency fluctuations and inflation are not considered while calculating the revenue of the Cushing’s syndrome and Acromegaly treatment market. Revenue from the Cushing’s syndrome and Acromegaly treatment market in countries of Asia Pacific such as China is expected to expand at the relatively higher CAGR due to lower install base, which reflects high market equity and developing healthcare infrastructure. To understand and assess the opportunities in this market, the report offers the market forecast on the basis of segment type classified into the product type, indications, end users and regions. The report provides analysis of the global Cushing’s syndrome and Acromegaly treatment market in terms of market value (US$ Mn). By drug type, the global Cushing’s syndrome and Acromegaly treatment market is segmented into Cushing’s syndrome treatment and Acromegaly treatment. The Cushing’s syndrome treatment is further sub segmented into Glucocorticoid Receptor Inhibitors, Somatostatin, Ketoconazole HRA, and other Off-label. The Acromegaly treatment is further sub segmented into Somatostatin, Glucocorticoid Receptor Inhibitors, and other Off-label. Based on the distribution channels, the global Cushing’s syndrome and Acromegaly treatment market is segmented into hospital pharmacies, retail pharmacies, and online pharmacies. The report begins with the market definition of Cushing’s syndrome and Acromegaly treatment, followed by definitions of the different segment types. The market dynamics section includes an analysis on key trends, drivers, restraints, opportunities and macro-economic factors influencing the growth of the global Cushing’s syndrome and Acromegaly treatment market. In addition, we have considered Year-on-Year (Y-o-Y) growth to understand the predictability of the market and identify growth opportunities for companies operating in the global Cushing’s syndrome and Acromegaly treatment market. Another key feature of this report is the analysis of the key segments in terms of absolute dollar opportunity. This is usually overlooked while forecasting the market. However, absolute dollar opportunity is critical for assessing the level of opportunity that a provider can look to achieve, as well as to identify potential resources from a sales and delivery perspective for services offered by the Cushing’s syndrome and Acromegaly treatment market. To understand the key segments in terms of their growth and performance in the global Cushing’s syndrome and Acromegaly treatment market, Persistence Market Research has developed a market attractiveness index. The resulting index will help identify the existing market opportunities in Cushing’s syndrome and Acromegaly treatment market. In the final section of the report, a ‘competitive landscape’ has been included to provide a dashboard view of the key companies operating in the global Cushing’s syndrome and Acromegaly treatment market. This section is primarily designed to provide clients with an objective and detailed comparative assessment of the key providers specific to a market segment in the Cushing’s syndrome and Acromegaly treatment market. However, this section also includes market strategies and SWOT analysis of the key players operating in the global Cushing’s syndrome and Acromegaly treatment market. Detailed profiles of the manufacturers of Cushing’s syndrome and Acromegaly Treatment are also included in the scope of the report to evaluate their long- and short-term strategies. Examples of some of the key players operating in the Cushing’s syndrome and Acromegaly treatment market are Novartis AG, Corcept Therapeutics, HRA Pharma, Bristol-Myers Squibb Company, Pfizer Inc., Ipsen Biopharmaceuticals, Inc. among others. Cushing's syndrome involves symptoms such as high blood pressure, abdominal obesity, round red face, a fatty lump between the shoulders, weak muscles and bones, acne, fragile skin and others. Most Cushing's syndrome cases are caused by pituitary adenoma, and multiple endocrine neoplasia. Acromegaly involves symptoms such as enlargement of the hands, feet, forehead, jaw, nose etc. resulting in joint pain, thickening of skin, deepening of the voice, headaches, and vision problems. Other complications include type 2 diabetes, and hypertension. Acromegaly is also caused by production of excess growth hormone (GH). Most cases of Acromegaly is due to the pituitary gland producing excessive growth hormone mostly due a benign tumor, known as a pituitary adenoma. The incidence rate of Acromegaly is about 2 to 3 people per million each year. The Cushing’s Syndrome and Acromegaly treatment market by drug type is segmented into Cushing’s syndrome treatment and Acromegaly treatment. The Cushing’s syndrome treatment is further sub segmented into Glucocorticoid Receptor Inhibitors, Somatostatin, Ketoconazole HRA, and other Off-label. The Acromegaly treatment is further sub segmented into Somatostatin, Glucocorticoid Receptor Inhibitors, and other Off-label. Based on the distribution channels, the global Cushing’s syndrome and Acromegaly treatment market is segmented into hospital pharmacies, retail pharmacies, and online pharmacies. In terms of revenue, the global Cushing’s Syndrome and Acromegaly treatment market is projected to expand at a CAGR of 9.3% during the forecast period. Asia Pacific is expected to witness siginificant growth in the global Cushing’s Syndrome and Acromegaly treatment market, dominated by Japan, Australia and China. The global Cushing’s Syndrome and Acromegaly treatment market is segmented into seven major regions, namely North America, Europe, Latin america, Asia Pacific and rest of world. In terms of value, North America is expected to be the dominant regional market for Cushing’s Syndrome and Acromegaly treatment by 2026 and is expected to expand at a CAGR of 9.7% over the forecast period. Europe and Asia Pacific are expected to be the fast-growing markets in terms of revenue in the global Cushing’s Syndrome and Acromegaly treatment market, registering CAGRs of 8.9% and 10.5%, respectively, over the forecast period. The rest of the world Cushing’s Syndrome and Acromegaly Treatment market is dominated by South Africa and gulf countries owing to their high healthcare expenditure and per capita income. Technology gains is the large market opportunity for ther Cushing’s Syndrome and Acromegaly treatment market. The development of targeted drug therapy with minimal side effects is expected to drive the adoption of Cushing’s Syndrome and Acromegaly treatment products. The support to orphan diseases and imaging by the governments of different countries is the other factors expected to boost the growth of the market for Cushing’s Syndrome and Acromegaly treatment. Demographic drivers include the ageing of the world population and the growing healthcare expenditure around the world. The relapse rates for Cushing’s Syndrome and Acromegaly after surgery is as high as 15 to 20 % which is another driver of the Cushing’s Syndrome and Acromegaly treatment market. In North America, the U.S. is the dominant market for Cushing’s Syndrome and Acromegaly treatment due to faster uptake of technology and large purchasing power. The excellent reimbursement and growing incidence of Cushing’s Syndrome and Acromegaly are also expected to support the growth of the market for Cushing’s Syndrome and Acromegaly treatment. Besides, presence of large players such as Novartis AG, Pfizer Inc. and others is also expected to drive the growth of the Cushing’s Syndrome and Acromegaly treatment market in the U.S. The healthcare expenditure in the U.S. was almost 16% of its GDP in 2017, which amply reflects better pricing and market attractiveness. The second dominant market for Cushing’s Syndrome and Acromegaly treatment is Europe which is dominated by Germany owing to the presence of large medical industry and presence of advanced players, such as HRA Pharma. The growing healthcare infrastructure as well as healthcare expenditure of Europe, which accounts to average 10 % of the GDP, are factors driving the growth of the Europe Cushing’s Syndrome and Acromegaly treatment market. Other European nations with a sizeable market are France, the U.K. and Spain. The Asia Pacific market is dominated by Japan, Australia and India. However, China is expected to witness fast growth in the Asia Pacific Cushing’s Syndrome and Acromegaly Treatment market. The consolidation of large healthcare providers coupled with greater healthcare insurance penetration is another driver of the Cushing’s Syndrome and Acromegaly treatment market.